Tigers Party Bus – Detroit’s Best Party Bus Experience! Detroit’s Biggest Party Bus Experience! SEE MORE PHOTOS — CLICK HERE! Round trip Motor Coach from Royal Oak, Novi, or Partridge Creek/Chesterfield to Downtown Detroit, Loads of Beer, Vodka Cocktails plus shots of Tippy Cow Orange Cream & Vanilla Soft Serve Flavored Rum Cream served on the bus ride to downtown. 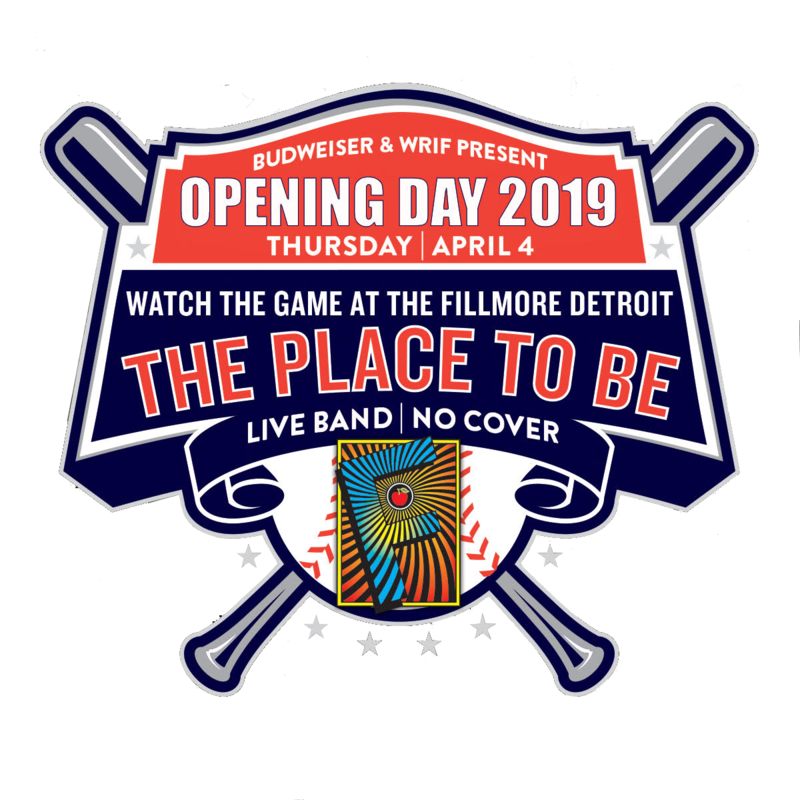 Get FREE entry to the Town Pump Annual Opening Day Party & VIP Skip-The-Line tickets to The Fillmore Detroit’s Annual WRIF Bash. You can also bring your favorite beverages with you! Fillmore’s Annual WRIF Opening Day Bash! All packages include: RT motor coach transportation from Royal Oak, Novi, or Partridge Creek to Downtown Detroit, plenty of beer & vodka cocktails plus Tippy Cow served on the way downtown. 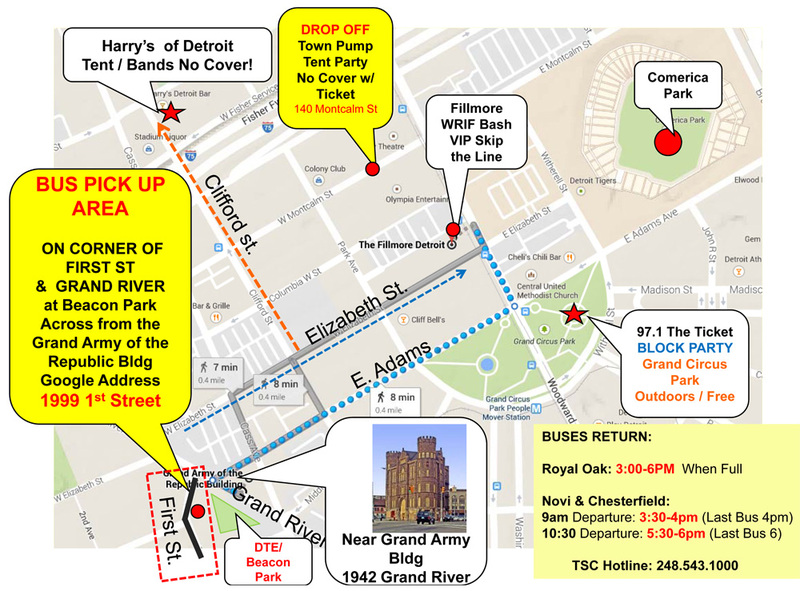 Also get FREE entry to the Town Pump & FREE VIP Skip-the-Line ticket to the Fillmore Detroit’s Annual WRIF Opening Day Bash and other Downtown Detroit Parties! Buses begin returning to Royal Oak at 3pm, and will continuously run when full until 6pm. Buses returning to Royal Oak leave as they fill on a first-come, first-serve basis. Please note that alcoholic beverages are not served on the ride home. Departure & Return Times are subject to change. BUY 6+ TICKETS, GET 1 FREE! 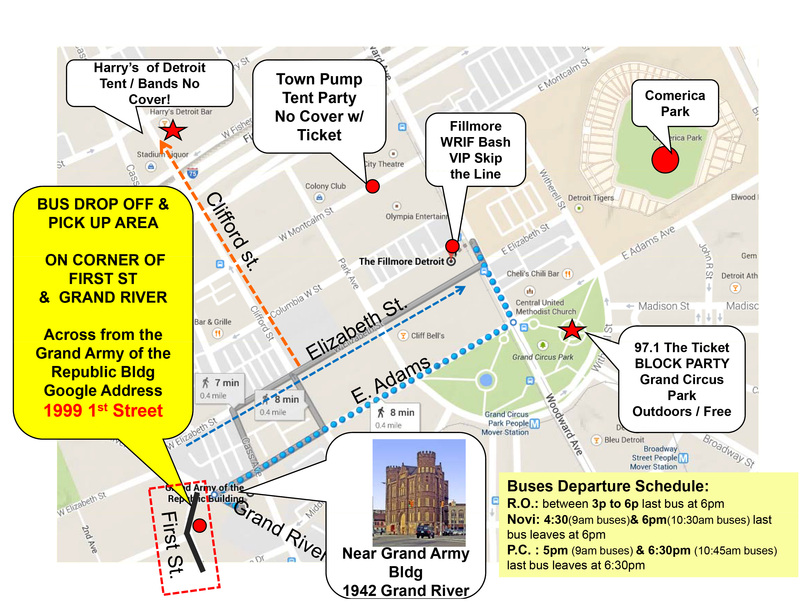 Novi: Guests of the Opening Day Party Bus will receive parking information via email 48 hours prior to departure. Partridge Creek/Chesterfield: guests of the Opening Day Party Bus can park in the Partridge Creek / Macomb / Chesterfield area will receive parking information via email 48 hours prior to departure. ALL THE FUN WITHOUT THE COST! Benefits Include: Everything our party bus riders receive – ride, drinks, free cover to parties. Your job? Helping our guests have a great time on the way down, including seating them on the bus and handing out beer & drinks on the way down. $65 Value! Registration for Novi departure Info Will be Emailed to Riders 48 hours prior to departure. All Ticket Sales Are Final – NO REFUNDS. Rain or Shine Bus Events do not have rescheduled dates.